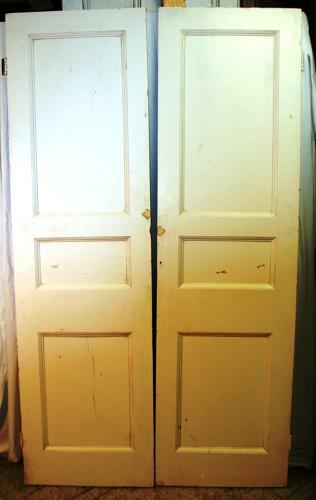 A pair of reclaimed, Georgian style, late Victorian pine panelled internal doors that would be suitable for a wardrobe. Each door has 3 fielded panels with decorative moldings to the front face and plain panels on the back. The doors are well constructed with mortise and tennon joints and good quality pine. The doors are antique and therefore have some signs of wear. There are some holes, marks and discolouration where the door hardwear has been removed. The doors have some cracks and knocks to the wood and chips to the paint. There is some damge to the top of one panel where the wood has broken and chipped, please see pictures for details. The doors are in solid useable condition but would benefit from stripping and refinishing by purchaser as desired. The doors are an ideal size for a wardrobe front, en-suit or conservatory and have an attractive design and an abundance of style.